Here is a male proboscis monkey. I don’t know what the girls see in him. 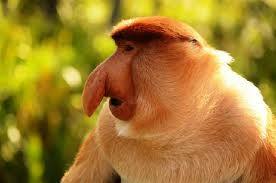 One of the funniest animals in the world is the proboscis monkey. Only the males have the big nose that they are known for. Their nose is thought to attract females as it makes their calls louder. Baby proboscis monkeys are born with black fur and a bright blue face. They are excellent swimmers and have partially webbed feet. Proboscis monkeys live in forests near rivers and mostly eat young leaves. They also eat fruit, seeds and flowers. This endangered species is only found on the island of Borneo, where loss of habitat making it hard for them to survive. Are there any other interesting facts that you would like to share about proboscis monkeys? Fantastic to see that some people put information about the proboscis monkey online as sometimes when researching it, it can become hard as there isn’t much information about it 🙂 Thanks! !